You are here: Home / Korrektiv Press / Bird's Nest in Your Hair / Tweaked. It’s all about the pigtails on Comrade Fountain Pen. I knew it was only a matter of time before you started grumping about your lack of a neck. Shouldn’t an enlarged duplicate of Comrade Bullhorn’s speech-bubble be emerging from the big end of the megaphone? It’s coming from the Chomsky black-box area of his frontal cortex. There would actually need to be a new frame with the enlarged text, to show the time sequence from brain to sound waves. I like the way you think (about how to represent the way people think). I’m not grumping. Although I do think Mitsui poked more fun at you and me than he did with the others. My theory is it’s because he tuned into the fact that we’re the token liberals of the Kollektiv. p.s. It’s about time you liberals found yourselves being regarded as a token SOMEWHERE! I’m not really a liberal, but I play one on Korrektiv TV. But JOB! In the popular imagination, aren’t liberals often regarded as a-tokin’? 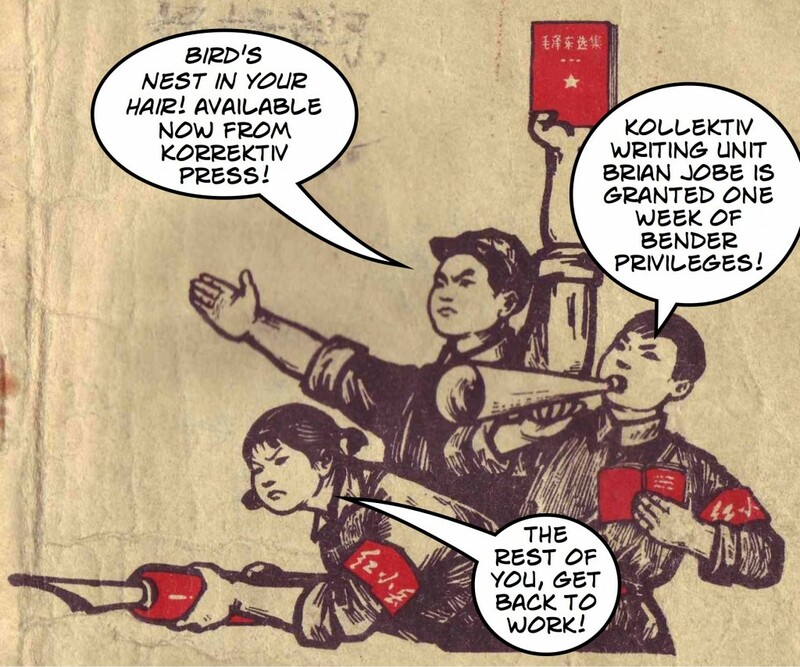 Wait, wait: Brian Jobe, the author of Bird’s Nest in Your Hair, is also a pseudonymous member of the Korrektiv Kollektiv!?!?!? It’s cute, Angelico, the way you pretend it isn’t you. Potter’s not grumping; Lickona’s just projecting. Get your k’s to fly right, man! JOB is correct, and by the way, you didn’t write that. Hey Lickona, are those bubbles a feature of Adobe? I dunno. I use a program called Comic Life. It comes in handy for the day job. Thanks! Bender has been postponed due to stomach flu, unfortunately. May I have an extension? Oh man, I am so sorry. Seriously, it’s the worst. In fact, it has brought me to the brink of questioning my faith. I know you have to earn your ‘bully’ moniker, Big Jon, but it’s awfully mean to do your Lickona impression right here where he can see it. Still, kudos: It’s almost dead-on! The stomach flu made me wrestle with the problem of evil. Noxious particles claim another victim. I’m praying that your body may quickly recover the strength it needs to withstand a legendary bender. Salve! And yet, here we are: commenting on a two-day-old blog post.